ST. LOUIS - Webster University has added a new feature to the annual Commencement Ceremony at The Muny – a Snapchat filter. 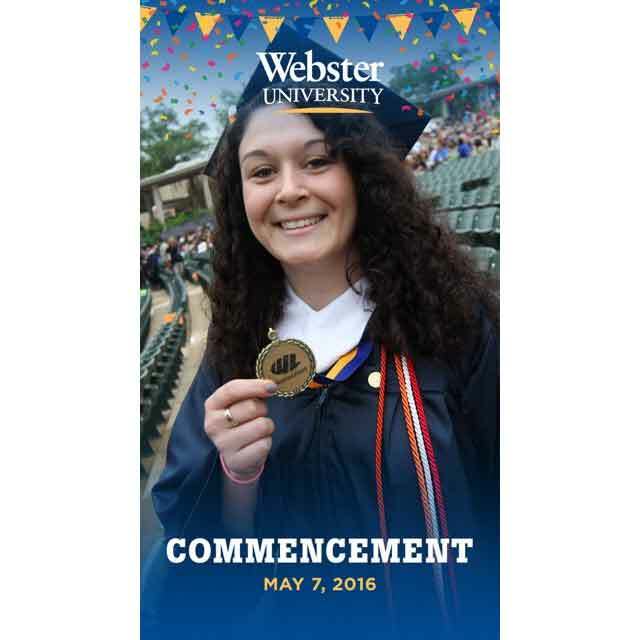 From 9 a.m. to 3 p.m. on May 7, any Snapchat user in or around The Muny will find a special “Webster University Commencement” filter available in the program. The filter will let users select a graphic with the day’s date and “Webster University Commencement” on any photo taken with the app, allowing graduates and their friends and family to easily share graduation photos with those in their Snapchat Network. Snapchat is a messaging program that allows users to send messages, photos and videos to other Snapchat users. The messages disappear from the network after 10 seconds, unless it is saved as part of the “story,” which preserves messages for up to 24 hours. From there, messages and images can often be captured and shared on other social media. Snapchat is one of the most popular social media networks today. With more than 200 million users, it’s estimated that nearly 20 percent of adults and nearly 60 percent of all 18 to 34 year-olds use the program. Currently, Snapchat is the third most used social media, behind Instagram and Facebook. During Commencement, employees of Webster University’s Global Marketing and Communications will share images and messages from the day on the University’s accounts on Twitter (@WebsterU), Facebook (WebsterUniversity) and Instagram (WebsterU). The University is encouraging users of Twitter, Facebook, Google+ and Instagram to use the #webstergrad hashtag when posting graduation photos and messages to those networks.